and for coming along with us! We'll see you the next time we take a trip! This Will Be Our Last Post Until Boston. See you then! Some ice for your drink? He was nice enough to pose before taking away this sculpture. "Cool"
Relaxing by the pool at night. No competition for a deck chair! Our trip comes to an end tomorrow. We're still enjoying today, though. enjoy the familiar places, including being back in the U.S.
A note about the map, above: it shows the trip as beginning in Boston and ending in Montreal. 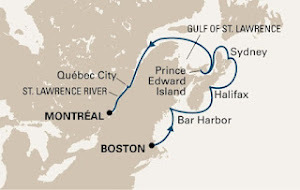 Our trip goes the other way—we start in Montreal and end up in Boston. In keeping with "going backwards", start at the bottom of this blog and read from the bottom up! It'll make more sense that way. Newer postings always end up at the top. Whew! Made it to Detroit!